Carlos Molina, Elizabeth A. Bell, Connie Castanzo, Bill Christ, Sarah Kiefer, and Noah Witke in Epic Poetry. Photo by Martina Granger. 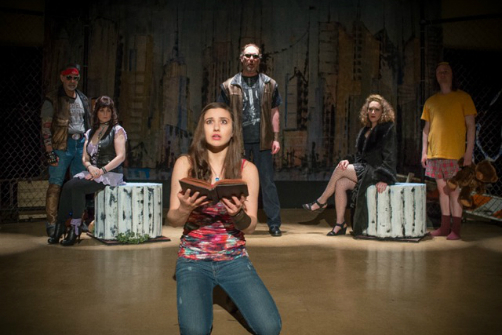 BOTTOM LINE: A modern take on The Odyssey through an urban landscape. Those of you who are fellow residents of Washington Heights or Inwood may be pleasantly surprised to know there are theatre companies in our forgotten sliver of Manhattan. No, I’m not kidding. And for the past five years Up Theater Company has been producing plays with artists local to uptown Manhattan. This spring its Artistic Director James Bosley is presenting an interesting work of his own – Epic Poetry – a thoughtful though sometimes digressive modernization of Homer’s famous The Odyssey. Bosley’s story centers on Lief (Connie Castanzo), a fifteen year old girl with a penchant for – you guessed it – mythology and “epic poetry.” Her father is the famous Otis, or Odysseus, or Ulysses (Bill Christ), and he has been gone for the past ten years. In his absence his wife Penelope (Laura Fois) has been dating the despicable Albert (Rik Walter) much to the disappointment of Lief. Albert has been “fixing” the house Otis had built with the feverish frenzy of a man who wants to make the place his own. The constant housework already puts the distressed teenager in a perpetual state of angst, but her patience runs out when her mom announces she will be marrying Albert. Epic Poetry addresses many topical issues. As Lief makes her way from home to New Jersey to Astoria, the characters she meets churn out questions or wisdom about imperfect families, growing up, war and its veterans, and the consequences the masses have to suffer at the hands of those in power (or “gods,” so to speak). The show also weaves in numerous references to other myths and heroes including Hades and Persephone, Orpheus, Hercules, and the notorious story of Oedipus. Needless to say, Epic Poetry covers an epic amount of ground. This cast of talented actors does a wonderful job at bringing these characters to life while they navigate personal odysseys of their own. Lue McWilliams is simply a delight on stage as Grandma, later revealed to be the Muse of Epic Poetry, Caliope, a woman desperate to maintain her significance in the modern world. Also, the entire design team created a world for this play that is both believable and enthralling. If you have any interest watching classics reimagined, or if you’re simply in the neighborhood, take a look at what Up Theater Company has to offer.